One of the most frequently asked questions about unschooling is how you can set up your home to be successful. This is a tricky question because unschooling really focuses on the interests of your child. At times, you might use books, and other times you might be outside for several days in a row. 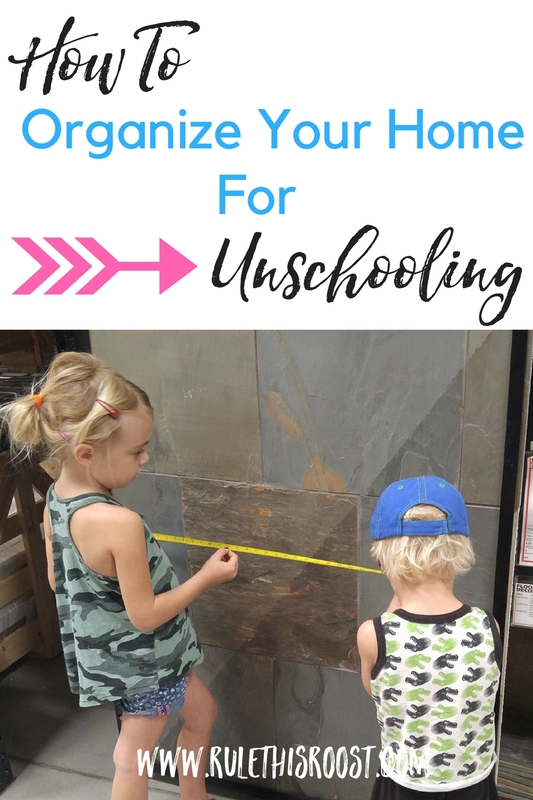 Organizing your home for unschooling is really dependent on the needs of your kids, but there are a few pointers that will help you get started. This post is part of a series on how to organize your unschool. Make sure to check out all of the posts! Designate a space for unschooling. This may sound weird. When most people picture unschooling, they probably picture a wild and free child in the forest searching for nature’s best treasures. While that is a completely legitimate view of unschooling, your child will most likely spend plenty of time indoors as well. If at all possible, having a space that is a designated unschool space will help tremendously. This will be the place where books can be stored and perused, bug boxes can be housed and creations can be displayed. Although a set curriculum is not generally used in unschooling, it is really dependent on what your child is interested in. So, if your child loves to do pencil-to-paper math problems in a workbook, you will need space for that too! This is where learning about your child really comes into play. You will know better how to organize when you have learned the interests and passions of your child. This is an ever-changing space to go with your child’s ever-changing interests. Provide real-life tools and supplies for kids to use. In our house, very few things are “off-limits”. The only things that can’t be used as learning tools are things that are dangerous. Even then, we usually just supervise with those items when our kids use them. Things like tape measures, scales, cooking utensils, and anything else that can help teach our children real-life skills, are fair-game. Each of our kids has their own toolbox with real tools in it. They know how to hammer nails, use a screwdriver and use their levels. Our kids also know that they can use measuring spoons, funnels and any other kitchen item and ingredient to experiment with recipes. Are they expected to put things away when they are done? Yep! That part doesn’t change. These real-life tools not only teach kids essential skills, but they also help build confidence when you show that you trust your child to use them. No matter what type of homeschooling you are doing, literacy is a cornerstone of education. Our days of unschooling include a ton of reading. Unschooling doesn’t follow a set program of learning to read, such as a phonics program. Because of this, it is super important that you provide a literacy-rich environment for your kids to be immersed in. ⇒A literacy-rich environment means that there are plenty of books available for kids at any time of the day. Most kids LOVE to read, and if they don’t it’s usually because of a negative past experience with trying to read books. Keep your kids in love with reading by providing them with books to read (themselves or with you) at any time of the day. ⇒A literacy-rich environment also means that you provide notebooks/paper and pencils for writing. We all know that when something is a hassle, we just don’t do it as much. This is the same for kids. If it is difficult to locate and use paper and a pencil, the chances of wanting to write are pretty slim. But, if you always have writing materials accessible, your child will be more likely to pick up a pencil and start writing (or drawing! That’s fine too!). ⇒ A literacy-rich environment means that your kids see you reading and writing. This will look different for each family, but kids need to see their parents reading and writing. It doesn’t mean that you have to be writing a novel, but even writing down the grocery list will spark an interest in young kids. Try to keep a journal that you and your child write back and forth in. Have a daily reading time together. This could be morning time, or night time, or both! What’s important is that your kids get to experience literacy with you. 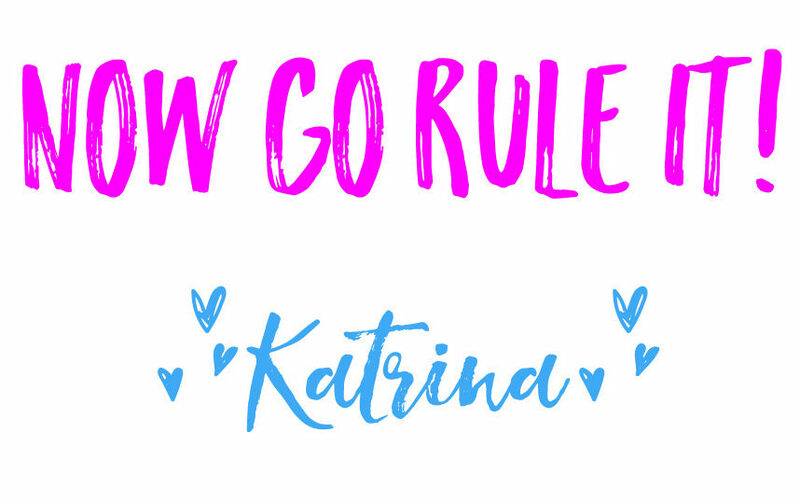 Related Post: 5 of the Most Awesome Children’s Books You NEED to Read to Your Kids! Provide space for kids to get messy. Kids like to get messy. Period. There is no sense in trying to stop messes while you’re unschooling. It’s how kids learn. Now, I’m not talking about destroying a house by splashing baking soda all over (not speaking from experience, or anything). I am talking about making sure there is a space where your kids can do art freely. This could even be outside, if weather permits. If you don’t have a space for messy activities, make sure that you are able to set something up when your kids are ready to get creative! One of the best things about unschooling is that you don’t have to stick with a schedule of subjects or curriculum that has to be completed. 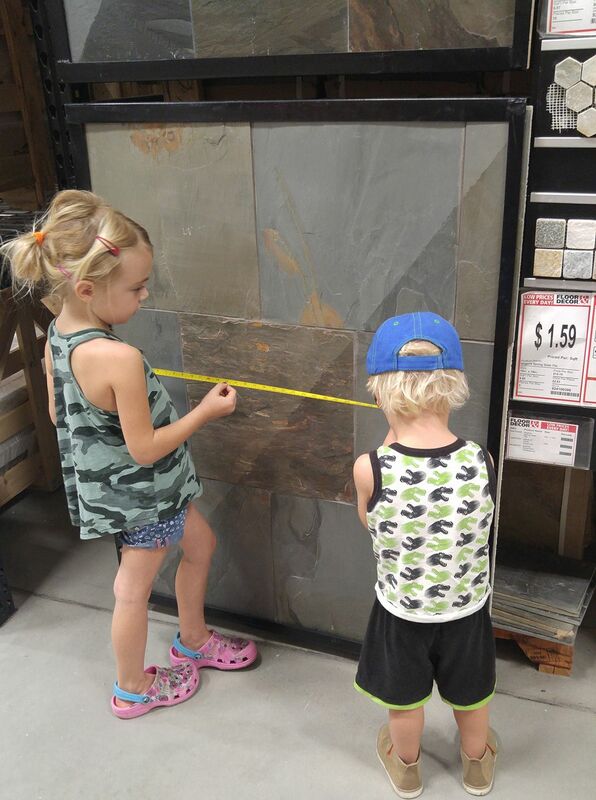 Your kids can enjoy the outdoors any time they want. 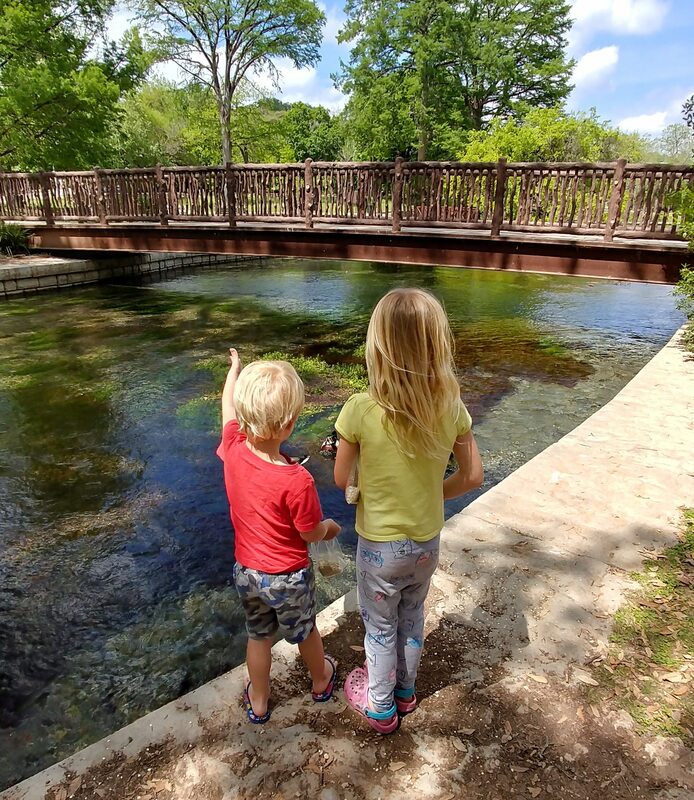 If you don’t have an outdoor space at your home, go to a park, or other outdoor nature area where your kids can explore. Being outside is essential to children developing appropriately and happily. 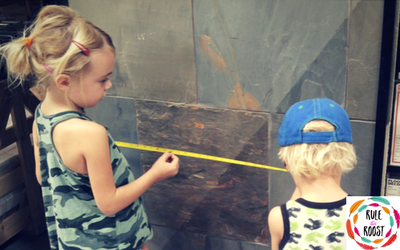 Organizing your unschooling environment doesn’t have to be complicated or extravagant. Follow your child’s lead with what they are interested in and the rest will fall into place. Enlist the help of your children when organizing your home for unschooling. They may have some really great insight that you didn’t even think of! 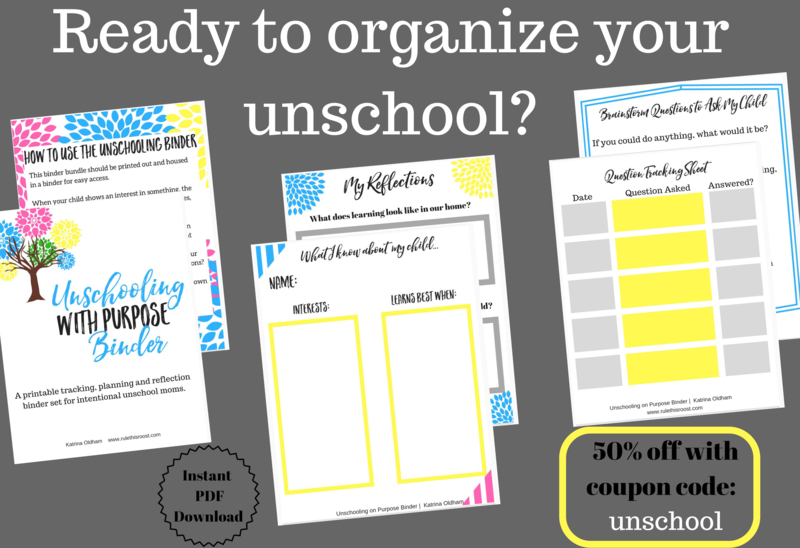 To learn more about how to organize your unschool, check out the previous posts in this 5-post series!